There are just so many wonderful feast days coming up for us to celebrate during Advent. It is going to be such a fun month as we joyfully prepare for, and then celebrate, the birth of Christ! In addition to our Jesse Tree, Advent Wreath, Advent Calendar and other Christmas preparations, I have been working on our plans for a few of the various feast days leading up to Christmas. Looking at the list, I'm not sure we will get to all of them, but it will sure help having them all planned out! I found another couple recipes for this feast day that I think we will try this year. We will make Barbarakuchen (St. Barabara Cake) and Schweinelendchen Barbara (Pork Tenderloin St. Barbara) from pages 34-35 of Cooking with the Saints. They both look quite yummy. We will also read pages 16-21 of Once upon a time Saints and this Story of St. Barbara for Children. This is one of my favorite feast days! We have a number of books about St. Nicholas that we will be reading the whole week prior to the feast of St. Nicholas. 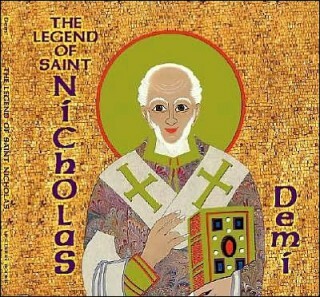 Our favorites is The Legend of St. Nicholas by Demi. We also really like The Miracle of St. Nicholas by Gloria Whelan. For breakfast I am planning on making St. Nicholas Hot Cocoa and a Candy Cane Coffee Cake. Sometime during the day we will watch Nicholas: The Boy who became Santa by CCC and read page 17 of Saints Lives and Illuminations. 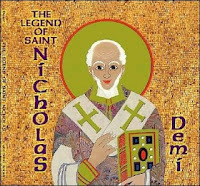 I also love Love LOVE this website which is dedicated to St. Nicholas. In fact my screensaver is actually a St. Nicholas day countdown that I downloaded from this site! :) It has so many fun things to do including many great coloring pages! I'll probably print a few off and let the kids color them while we listen to this wonderful CD by Anonymous 4. Since St. Ambrose is the Patron Saint of Candlemakers, we will decorate our Christ Candle today... We will just use a tall white pillar candle, and decorate it with these Candle Decorating Pens from Hearthsong--as long as they arrive on time! We will also read the story of St. Ambrose on pages 5-11 Once upon a Time Saints . Today after Mass, we will drape a Blue Cloth, or tie a blue ribbon, around the Christ Candle we decorated yesterday, in honor of the Blessed Mother. On Christmas Eve the cloth comes off and reveals Christ. This candle then takes the place of the Advent Candles for the Christmas Season. We will also read about and discuss the Immaculate Conception. There are TONS of great ideas at this link... I love the idea of taking a virtual tour of the Basilica of the National Shrine of the Immaculate Conception. We were there once when Captain was a baby, and so I might pull out our own pictures as well! So, I think we will bake this gingerbread cake that I've been totally craving looks delicious and put together our Gingerbread House for this special feast! I also will copy off the Marian Crossword Puzzle on page 55 of A Year With God. 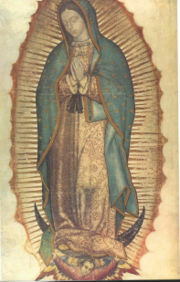 We will read page 19 of More Saints Lives and Illuminations and Our Lady of Guadalupe by Father Lovasik. Then we will listen to Fresh Flowers in Winter: The story of Saint Juan Diego by Glory Stories while the kids color pictures out of Our Lady of Guadalupe Coloring Book by Mary Fabyan Windeatt. I plan to pray the Litany of Loreto with the children. Oh! And here is an online crossword of the Marian Titles from the Litany of Loreto! For this feast we will be attending Mass, and then a celebration afterwards, with our Homeschool Group. When we get home we will read The Lady of Guadalupe by Tomie dePaola. Also, this craft looks like such fun, but I think it will probably have to wait till next year!! Today we will make Santa Lucia's Bread for breakfast, or have round Donuts with lighted birthday candles inserted. (if I don't have a chance to make the bread!) We will also read about Saint Lucy and color the picture in Fenestrae Fidei. I so wish I could sew and make one of these! Today we will read page 24 of More Saints Lives and Illuminations. Being Friday, it might be a good night to watch St. John of the Cross as well! "In Mexico, the houses are decorated and ready for guests by December 16th. From this night until Christmas, people will have parties and the traditional posadas. The posadas commemorate the journey of Mary & Joseph and their attempt to find lodging." I thought this would be a great day to read The Night of Las Posadas by Tomie dePaoula. Maybe I will even attempt to make my mother-in-laws flan for dessert... Although, it NEVER turns out as yummy as hers! I hope this list will help you with your own plans, and that you all have a very blessed Advent! How blessed your children are to have a mother who makes Advent so meaningful! Just perfect! Thanks for such a comprehensive list. You really put a lot of work into this. I am sure we will glean some things to use for our Advent celebrations for it! Thank you for the wonderful ideas for Advent. The feast days shall be lovely here with all the ideas that you have provided for our family.